When you can't decide whether to say aameen while watching the 'live-dua' from Makkah on DSTV. Making shukr for ios 7 as now you can put Bukhari in a different folder/collection on your ibooks, instead of it being next to FHM. Being bummed because 786 zn was taken. Explaining to your non-muslim colleagues that fasting doesnt mean 'no meat'. Not being able to get into the Turkish musjid because people are taking selfies at the entrance. Please add yours to the comments or use the #muslimfirstworldproblems on Twitter. I have fond memories playing the original Scribblenauts on my DS a few years ago. Revolutionary at the time, I would spend hours trying to think up weird solutions to the challenges (actually I’d mostly just type ‘shark’ and see how it would solve the problems. However, the world has changed since 2009 and I’m not sure if Scribblenauts Unlimited (the fourth title in the series) can compete with the level of innovation shown in Tearaway and LittleBigPlanet. For those unfamiliar with Scribblenauts, it is classified as an ‘emergent action puzzle game’. You control a chap named Maxwell and have to solve a series of challenges by inserting objects into the environment. Unlike the previous titles which had no narrative per se, in this version you have to save your sister from turning into stone (a consequence of a curse due to you being a bit of a bell-end to an old dude). The game now takes place in an over-world, with you approaching random NPCs. Adjectives have also made it through (something from the second game) and this adds to the experience. Fans will be glad to know that there are fewer moments that require you to have the precision of a surgeon doing open-heart surgery so that is a plus. The graphics remain cheerful and bright, with the sprites gaining a lot of detail since the 2009 review. Unfortunately, 3D is completely underused, which is a pity as that would have been a solid USP. I do understand why they the developers have gone down this route (the game is a side-scroller) but New Super Mario Bros 2 showed us that you can have both. wii u screenshot. Sadly, the 3DS version doesn't have an object maker. A major negative I have, and this is not against the game, but rather, the way I approached it, is that I spent a lot of time trying to figure out objects that they wouldn’t have, rather than marvelling what they did. This isn’t fair on the game but does highlight something about the game – scribblenauts requires an investment of time, often unrequited in this age of quick-fix gaming. Even though the main missions are a few minutes each, I couldn’t pick up and play as easily as I would ‘Angry Birds’. It can all be rather overwhelming for many players and I think the drop-off rate is probably quite high. Perhaps this can be solved by marketing it differently. I think it would be quite powerful as an educational tool targeted at parents. Spelling bees are all but rare in this country, so it would be a great initiative if Scribblenauts bridged that gap somehow. Eid and Christmas must be a nightmare in this household. Speaking of South Africa, I was really thrilled that ‘Vuvuzela’ made the cut. Play it near Maxwell’s dad for a great reaction. 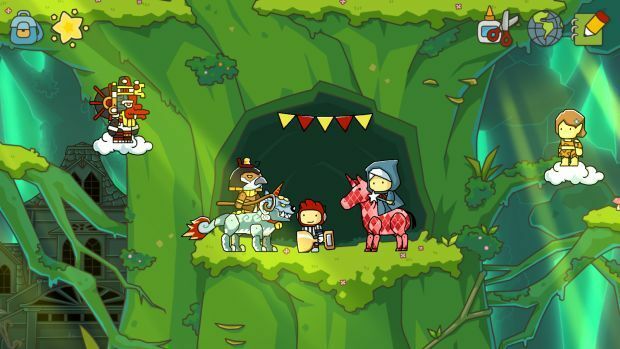 This basically sums up Scribblenauts for me. It is full of treasures which will put a smile on even the most jaded gamer’s face (this is also due to a number of great cameos that I won't spoil here), but only if you’re willing to put in the time and go for it. In conclusion, a really great game for anyone who is new to the franchise, but not a must have for current fans. This game was reviewed on a Nintendo 3DS XL. Thanks to Princess Peach (give her a follow on Twitter) and the team at Nintendo South Africa for all their support!